Laurine Bell, age 93, of Aurora, formerly of Giltner passed away on Friday, May 4, 2018, at Westfield Quality Care in Aurora. Funeral Services will be held at 11:00 A.M., Friday, May 11th at the Stockham Community Church. Rev. Paul Nauman will officiate. Interment will be in the Giltner Cemetery, prior to the service. Visitation will be from 5 - 7 P.M. on Thursday at Higby-McQuiston Mortuary in Aurora. Memorials may be made to the family to designate at a later date. Condolences may be e-mailed to the family through the mortuary website at www.higbymortuary.com. Laurine Anna Bell, the daughter of Harry and Anna (Dahlke) Johnson, was born in Phillips, Nebraska on January 4, 1925 and passed away in Aurora, Nebraska on May 4, 2018, at the age of 93. 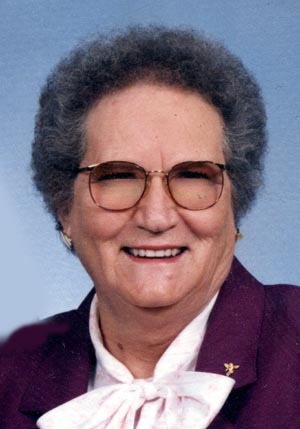 Laurine grew up in Doniphan and graduated from Doniphan High School in 1942. Laurine was united in marriage to Gene Adams on November 13, 1942. One daughter, Jean Ann was born to this union. Gene passed away during World War II in the Philippines on February 13, 1945. Laurine was united in marriage to Robert Clarence Bell on December 17, 1946 at Bellevue, Kansas. To this union they had two children: Dave and Kathy. They lived in Doniphan for a short time before moving to Giltner where she served as the Giltner Village Clerk from 1969 to 1971. Laurine then worked at the Hamilton Manor in Aurora in the Dietary Department and was the manager from 1976 to 1995. Clarence passed away on August 18, 2006. Laurine lived at the East Park Villa until she moved to Westfield Quality Care. Laurine was a member of the Gold Star Wives Doniphan American Legion Auxiliary, the Greenwood Club and the Stockham Community Church. She was preceded in death by her parents, both husbands; daughter, Jean Straatmann; three granddaughters, Brenda Fowler, Rochelle Straatmann and Chris Straatmann; great-grandson, Brandon Fowler and two brothers, Harold and Marian Johnson. Those who remain to cherish her memory are her two children, Dave (Nancy) Bell of Lake Havasu, Arizona and Kathy (Steve) Hosier of Giltner; six grandchildren, Bob Straatmann of Hastings, Brent Straatmann of Lincoln, Shane (Angie) Bell of Arvada, Colorado, Mykelin (Kirt) Watson of Giltner, Tyler (Jody) Hosier of Alvo and Lacie (Jeremy) Hogan of Giltner; 14 great-grandchildren; 11 great great-grandchildren; sister, Evelyn Behrends of Aurora and many other family members and friends.